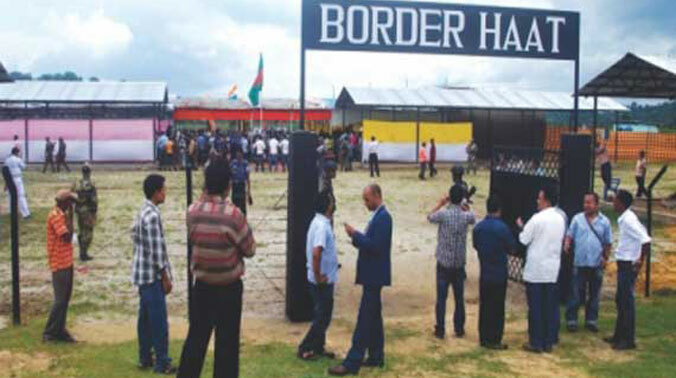 Bangladesh and India have agreed in principle to set up more border haats (markets) along the common borders of the two countries in future considering the local demand. The agreement was reached at a two-day Bangladesh-India commerce secretary level meeting that ended on Thursday at the Ministry of Commerce in Dhaka. Commerce secretary Shubashish Bose led a 16-member Bangladesh delegation in the meeting while Indian commerce secretary Rita Teaotia led the Indian delegation. The last commerce secretary level meeting was held in New Delhi on November 15-16 in 2016. The meeting expressed satisfaction over the operations of the existing four border haats along the Bangladesh-India borders. A decision was taken in the meeting to expedite the procedure of setting up six more border haats within the next six months, said a ministry press release here. The release said the meeting was held in a very friendly and constructive environment. It said India has proposed Bangladesh to form Comprehensive Economic Partnership considering the existing situation and friendly relations persisting between the two countries. The both sides agreed to gradually ensure infrastructural development and necessary facilities of the land customs ports along the Bangladesh-India borders alongside ensuring speedy offloading of goods from those land ports. Besides, on request, the Bangladesh delegation informed the Indian side that the proposal for allowing more exportable items from India through the land customs ports of Bangladesh is under scrutiny. Bangladesh requested India to allow its airports for exporting Bangladeshi goods to any third country while the two countries decided to form CEOG Forum to create a business-friendly environment through boosting bilateral relations between the businesses of the two countries. The Bangladesh delegation thanked the Indian side for already the recognition of the certificates of 21 food items by the BSTI side by side it requested India to give recognition to the rest six items. The Bangladesh commerce secretary requested his Indian counterpart to withdraw the anti-dumping duty imposed by India on the jute goods and hydrogen per oxide. Besides, a request was also made to India for extending cooperation to enhance the capacity of Bangladesh on anti-dumping duty. On the other hand, India requested Bangladesh to provide duty facilities for exporting Indian sugar to Bangladesh. As India is the 2nd largest trade partner of Bangladesh, the volume of bilateral trade between the two countries rose to $6.8 billion in the last fiscal year (FY17). The two-way trade between the two countries is still in favour of India as Bangladesh imported goods worth $6.13 billion in the last fiscal against the exports of $672.4 million. Although India has provided duty-free and quota-free access to some 25 Bangladeshi products, the trade deficit is yet to be reduced in such pace due to various barriers, including insufficient infrastructures and various non-tariff barriers. To minimize this trade gap and barriers as well as further promoting business-friendly environment between the two countries, bilateral meetings at different tiers often take place of which the commerce secretary level meet plays an important role. The Indian delegation is scheduled to depart here on Saturday.